The Living History Farm is open daily from 10 a.m. - 4 p.m. through September 9, 2018. In 1989, the Tinsley House was relocated to Museum of the Rockies, and the history of Montana’s homesteading era was recreated at MOR’s Living History Farm. Our skilled costumed interpreters will take you back in time as they cook over a wood-burning stove, demonstrate cooking skills and recipes from the 1890s, tend to the Heirloom Garden, and forge iron in the blacksmith’s shop. Take time this summer to enjoy the beautiful sights of the garden, the smells of home cooking, and the history of a time gone by that lives on today. The Farm is free to all, all summer long. "GUITAR: The Instrument That Rocked The World", is open daily from 8 a.m. – 6 p.m. through September 9, 2018. See over 60 guitars and nearly 100 historical artifacts that immerse you in the heart of music. Experience the rush of the world’s most recognized musical instrument through the powerful lens of science. You, too, can play a Guinness Record-breaking 43.5-foot-long guitar. 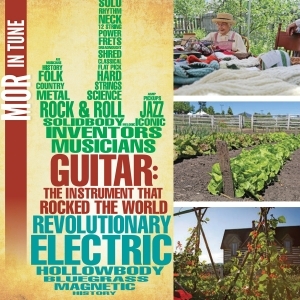 Plan your visit to experience the science, sound, history, and cultural impact of the guitar along with hands-on interactives, models, touchscreens, performance video, audio, and stunning images. Celebrate Montana’s luthiers and local musicians in weekly events for all ages, all summer long. The exhibition is included with admission.